KREYOL: Mezanmi... Maladi poul deyo Haiti... se pa ni de ni twa poul ki ap mouri nan peyi a... Nou pedi 8 poul nan 5 jou... se top blip poul ap tonbe... Kisa ou panse de sa? Also read: Common Poultry Diseases. When my cousin told me: "Yonn nan poul yo nan kalòj la malad wi!" (There is a sick chicken in the coop) My first reaction, growing up in the United States, was "Where is the nearest veterinarian?" The guy laughed like I made a joke! You mean to tell me Haiti's chickens get sick and die each and every year and there is no where to go, no one to ask, nowhere to find out what the cause is and how to treat it? or how to prevent it? Who is responsible for Haiti's livestock??? For someone like me who bought these chicken for food it is no big deal really BUT for the Haitian lady who comes by on Wednesdays and Saturdays to sell us her chicken eggs, it is more than a BIG DEAL, 8 manman poul mouri (8 dead chickens) represent a HUGE loss in revenue. I've seen this happen year after year. 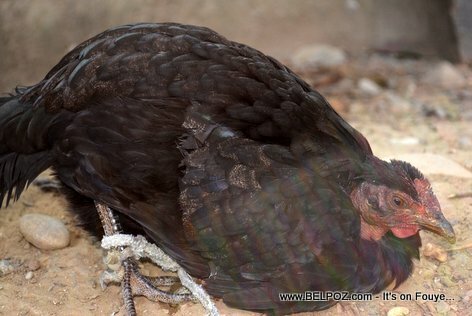 There is total ignorance on raising chickens (in a healthy way) and resignation that chickens get sick and die and there's nothing to be done. si ou byen mobilizéw soutou si sé nan provens ou lot koté ki gen yon gran téren ou yé ou ka riche nan poul la siw kon sa wap fè, yon bèt sé tankou yon ti moun siw pa prè pou pran swen yo korèkteman pa pèdi tanw, tout lajounen tou nan nwit infimyé ak infimyèr ap ba nou bon jan konsey sou zafè mikob, yo di nou lavé men nou souvan épi gen anpil nan nou menm ki gadé bèt épi nou kité bèt yo ap maché manjé tenten tout koté, sa yo ta bézwen di nou lavé men nou si bèt yo ap maché manjé jèm koléra, sida etc nan tè a épi pou nap manjé bèt sa yo. Pandan yap avèti nou kont mikrob machan yo ap van biskwit ou pain an sal yé a yo pa mét gan nan men yo, menm men kap manyen lajan an sé menm men an kap touché pen sa a ki nan vant nou sé nomal, lè yo rété yo diw ahhhhhh mikob pa touyé Haitien.